This MEAL (whaaaaat?) was made for a 20sb Cooking Challenge at the beginning of August that I never posted here. Whoops. So here it is in a bunch of glory. 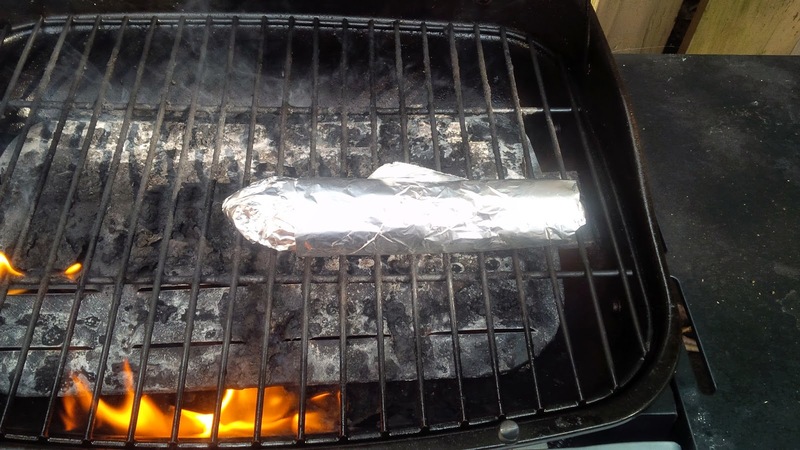 1) Preheat outdoor grill for high heat and spray grate with cooking spray. 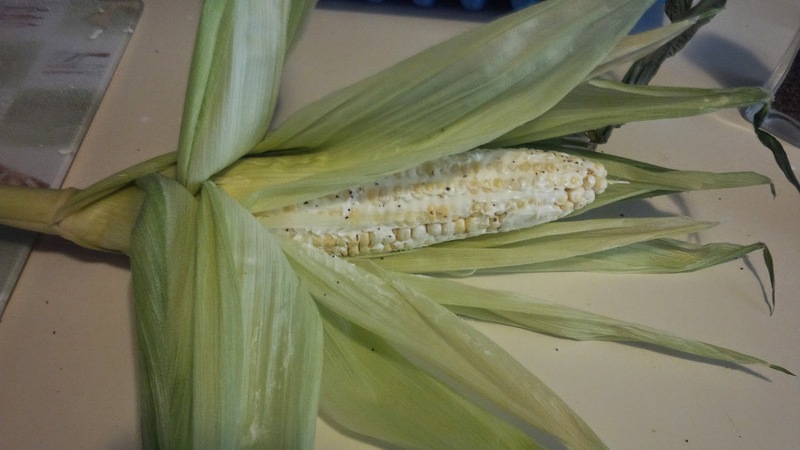 2) Peel back corn husks and remove silk. 3) Place or spread one Tbsp butter, salt and pepper on each piece and close husks. 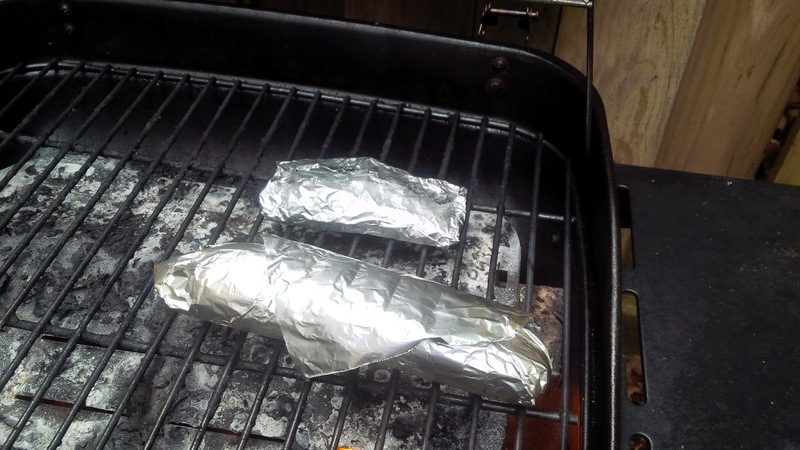 4) Wrap each ear of corn tightly with aluminum foil and set on grill. 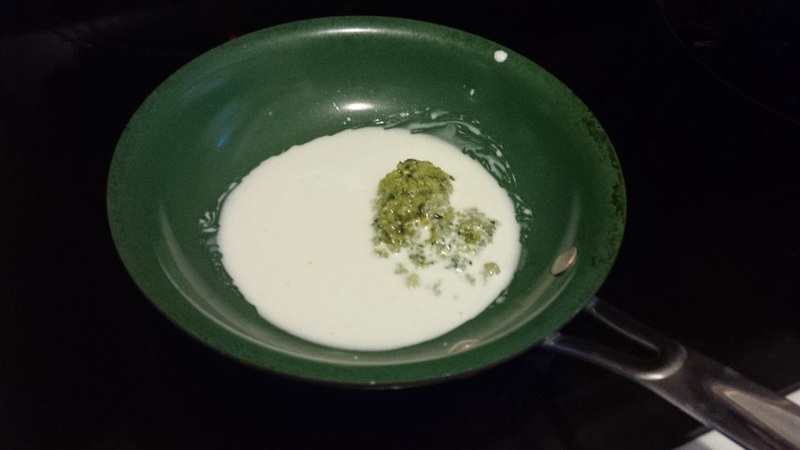 5) Combine glaze ingredients in a small saucepan and bring to a boil over medium heat. Reduce heat and simmer until thick, about 12 minutes. 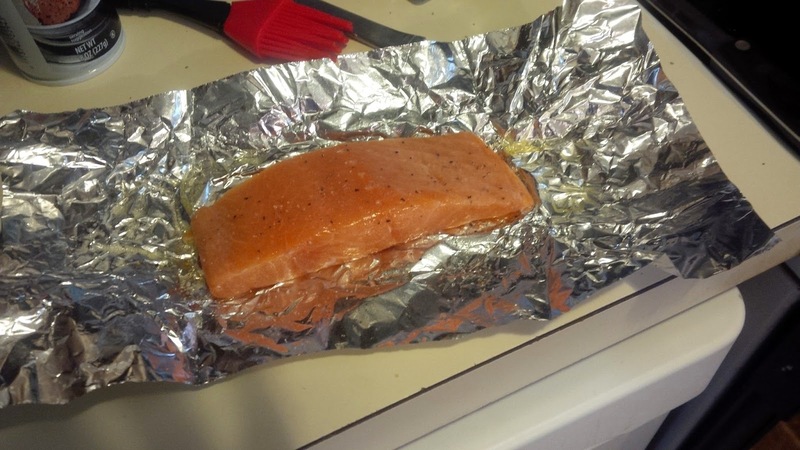 6) While glaze is reducing, spray one piece of foil for each piece of salmon with cooking spray. 7) Brush both sides of salmon with olive oil and season with salt and pepper. 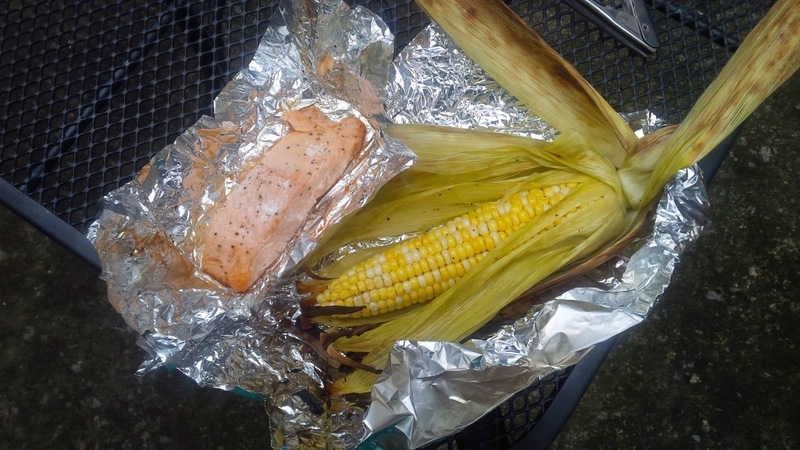 8) Close foil tightly around salmon, place on grill, and turn corn. 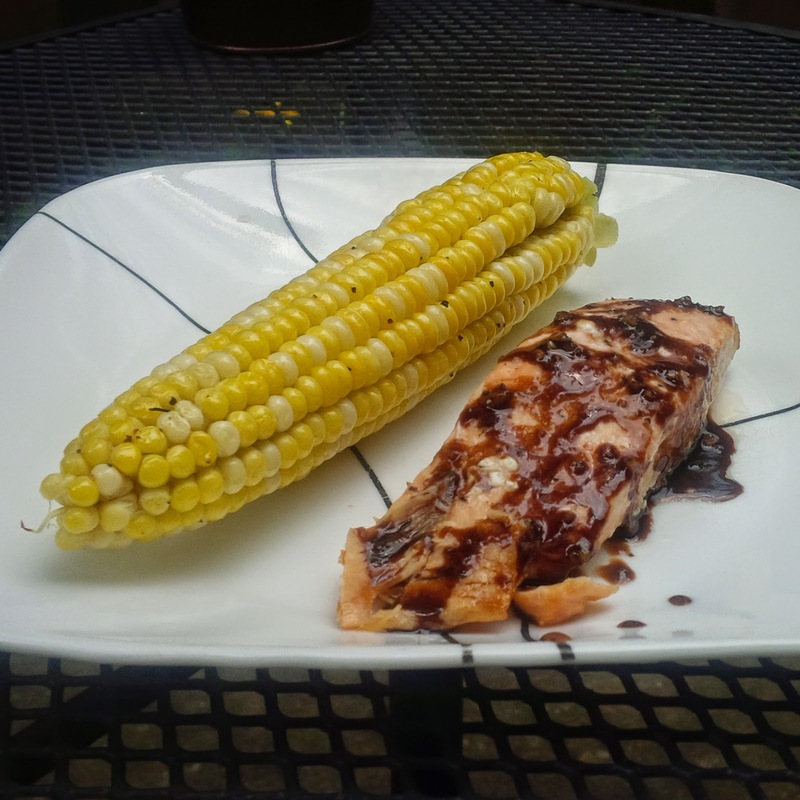 9) Remove salmon and corn after 10 minutes. 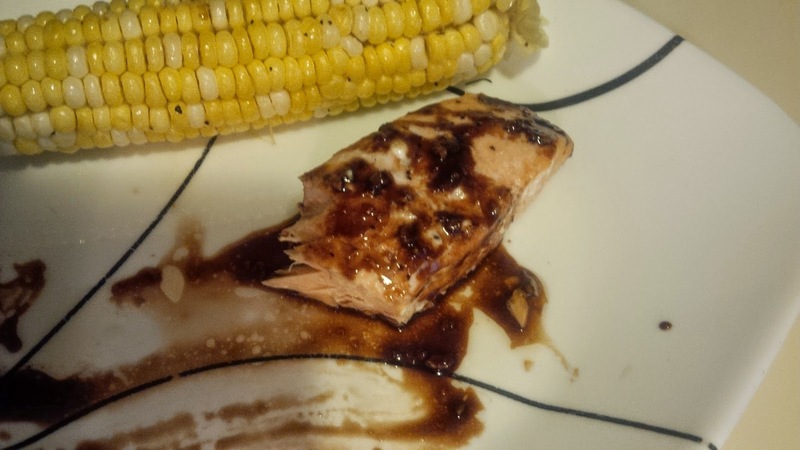 10) Unwrap salmon and corn after glaze has had 5 minutes to cool, and place corn and salmon on a plate. 11) Drizzle glaze on salmon, rinse and recycle the foil, and enjoy! This recipe was created for the current #20sbcookingchallenge: Homemade Fettucine Alfredo with Italian Breadsticks. 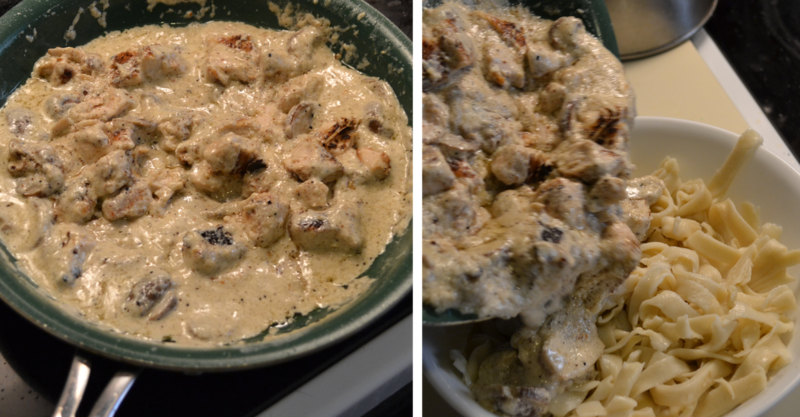 It was my first try at alfredo sauce and, damn, if it wasn't a zillion calories, I would make it all the time. I thought I wouldn't care for it because the only time I'd had alfredo sauce was somewhere I used to work and it was just bland and tasteless which is redundant but that's how lacking in flavor it was. 1) Cook pasta according to directions on the box, strain, and set aside in a large bowl. 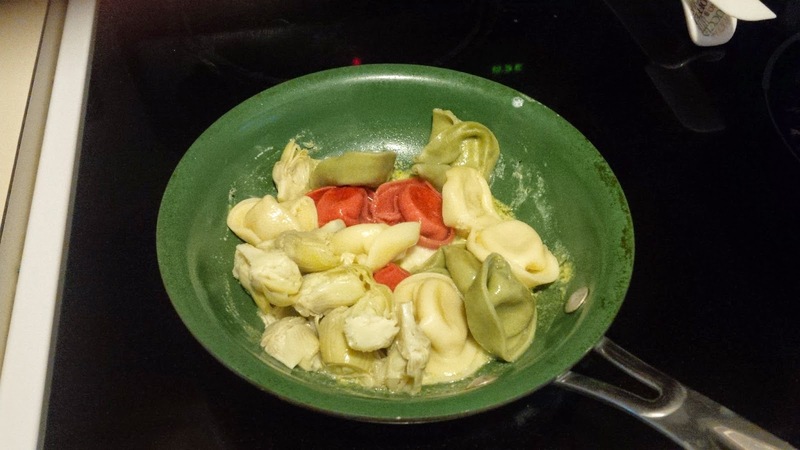 2) While pasta is cooking, set a medium saute pan over medium-high heat and add 1 Tbsp olive oil. 3) Coat chicken strips in bread crumbs. 4) When oil is shimmering, add chicken and cook for 3-4 minutes on each side. 5) Remove from pan and set aside. 6) Using the same pan, combine the butter, oil, and heavy cream and stir until all is melted and mixed well, then lower heat to medium. 7) Stir in the mushrooms, Parmesan cheese, garlic, salt and pepper, and simmer for 10 to 15 minutes stirring occasionally. If sauce starts to stick to bottom of pan, lower heat to medium-low. 9) While sauce is simmering, cut chicken into 1" pieces. 10) Once sauce is done, mix in the chicken pieces, then pour it over the pasta and chicken. 11) Toss to combine and serve! I used to work in a cafe in town where the only thing we could eat for free was the bread ends that would have otherwise been thrown away anyway. The discount for other food was only like 20% or something so I embraced eating the bread ends for free. I think we were only supposed to use butter or jelly as a topping but, being the rebel that I am, chose to go with cream cheese. After a few weeks I decided that I was going to go one step farther and add some bacon. It was that chintzy pre-cooked kind which could not have cost all that much so what was the harm really? And I just used a couple of slices. I thought I was going to hate it but I really wanted the added protein so I would actually not be really hungry every time I worked. Turns out I found this sandwich to be delicious. 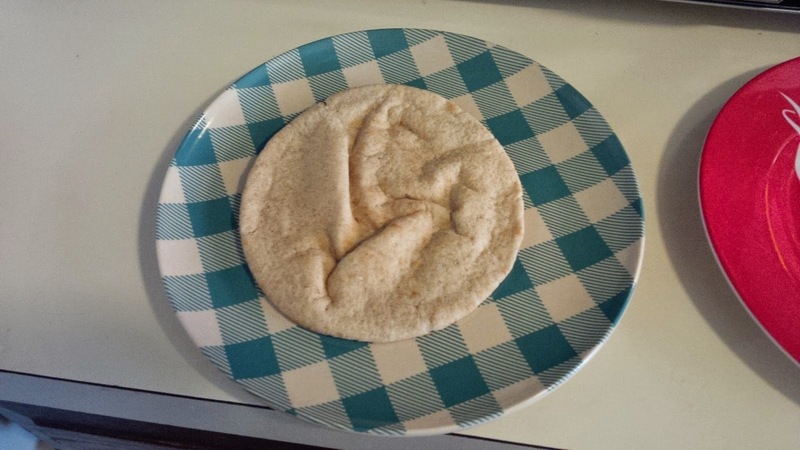 For calorie counting purposes, I started making it on pita bread. Give it a try, you might just love it too! 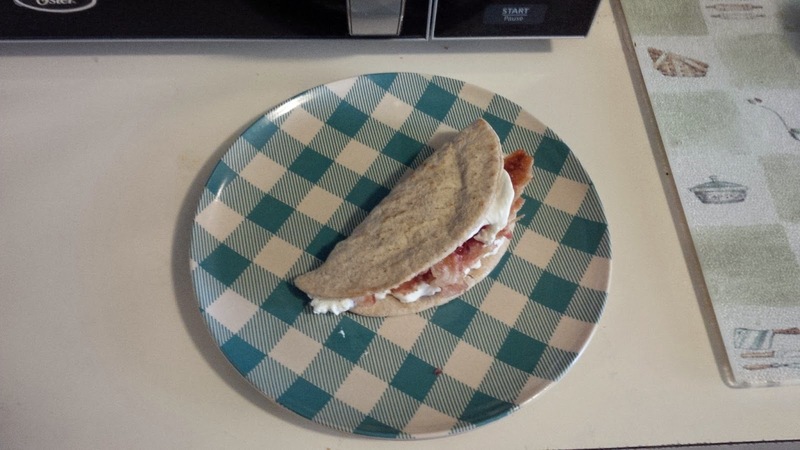 1) Cook bacon in microwave. 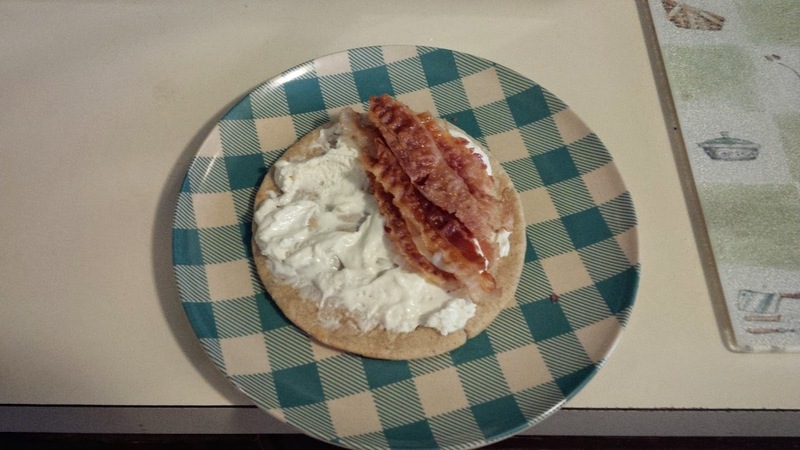 2) Lightly toast mini pita and set on a plate. 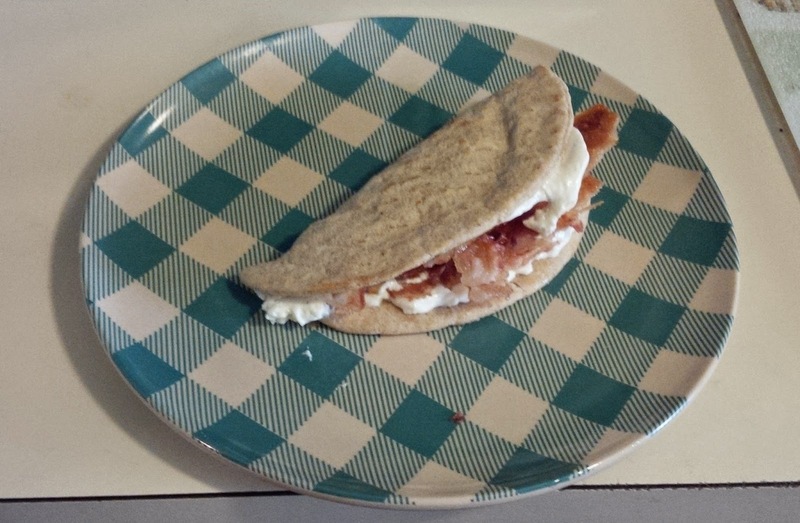 If you don't have a toaster oven or are using pitas too big for a toaster you can skip the toasting. 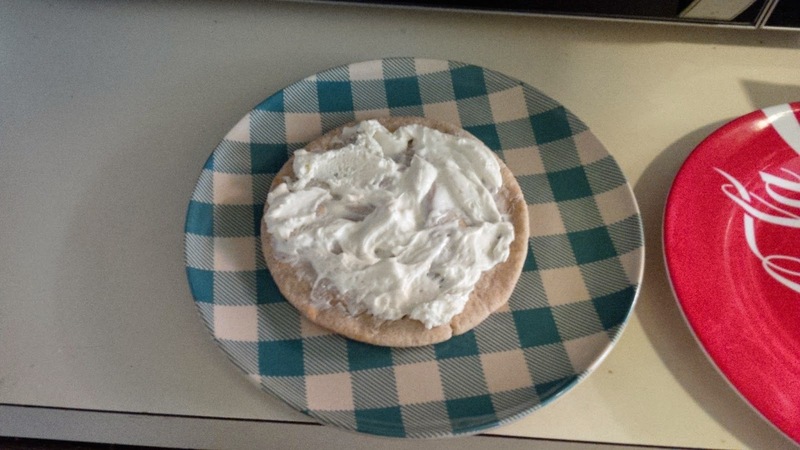 3) Spread cream cheese on surface of pita bread. 4) Add bacon to one side, breaking in half if needed in order to fit better. 5) Fold in half and enjoy! This is a menu item at a bar in town that I just adore (the tortellini, the bar I could take or leave). What I don't love is the $10 price tag so I decided to make my own at home. Once the pasta is cooked it's really quick to make and I'm sure much lower in calories than the dish I've been ordering. 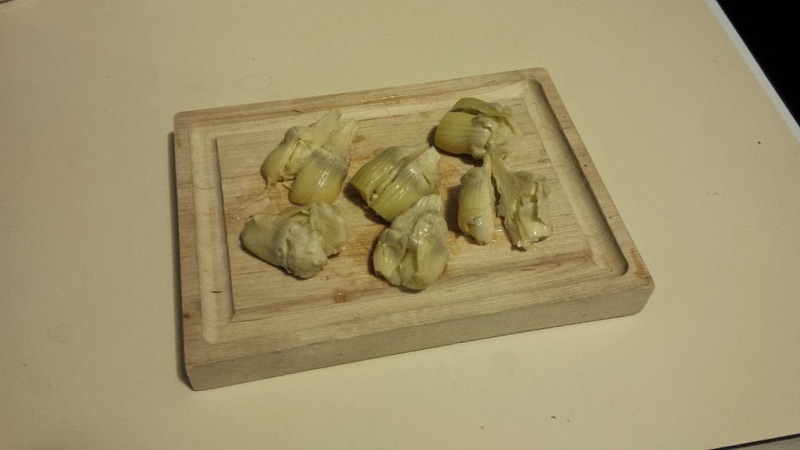 1) Cut artichoke hearts in half. 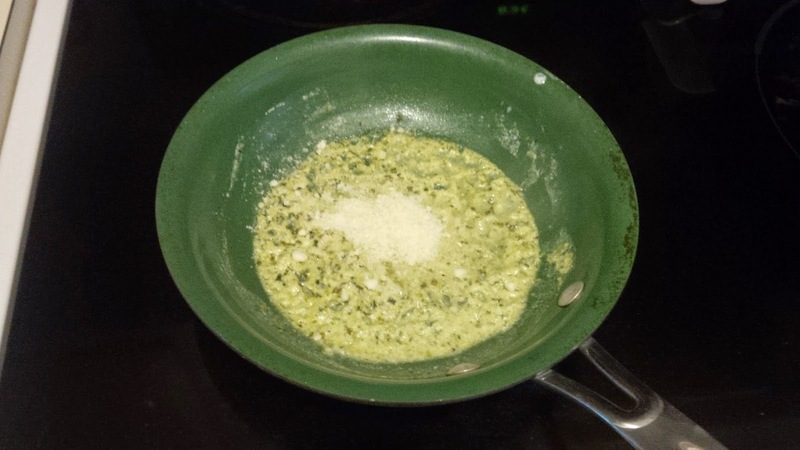 2) Put pesto and heavy cream in a saute pan and simmer until slightly thickened. 3) Stir in Parmesan cheese. 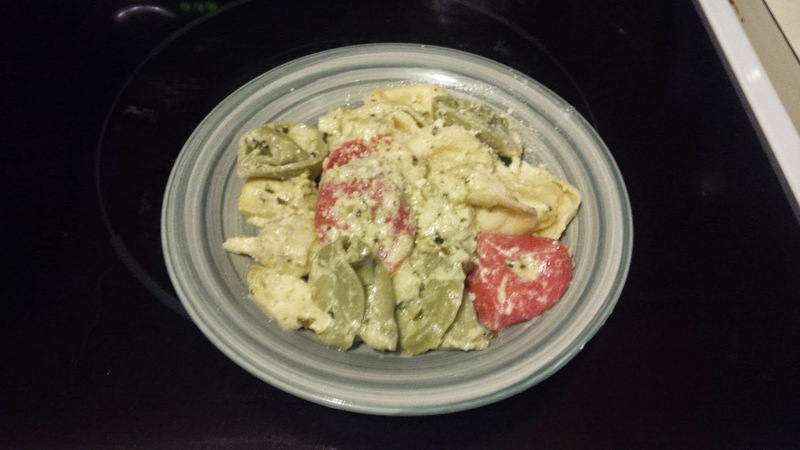 4) Add tortellini and artichokes. 5) Toss to combine and serve. Optional: sprinkle some extra Parmesan cheese on top. *For a lower calorie version, use a regular pasta of your choice! I was in Japan visiting my brother and he bought some sort of crispy-thing-on-a-stick that he said was fried soy something-or-other, which was really tasty, so I've wanted to try to make crispy tofu ever since. 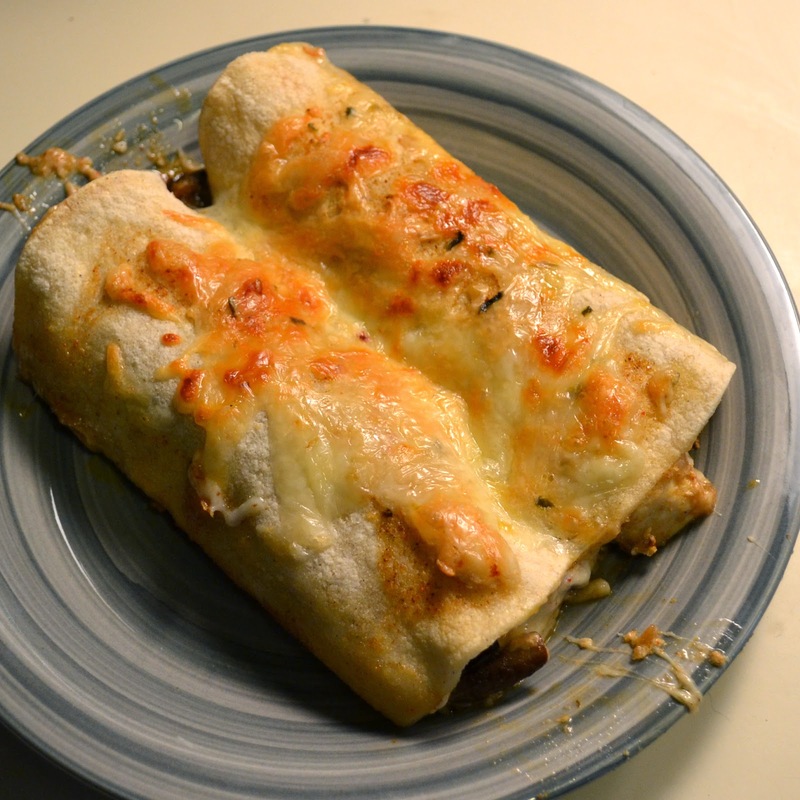 When I came across this recipe for Mushroom & Poblano Vegetarian Enchiladas (made with tofu), it sounded like something I could incorporate crispy tofu into so that I actually would like the recipe. So I decided to give it a try, making a few modifications. 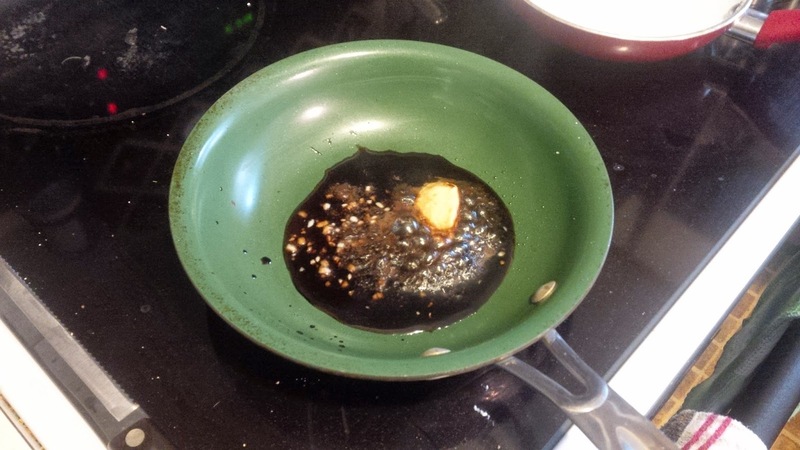 2) Combine oil, lemon, cumin, chili powder, salt, and garlic powder in a small bowl. 3) Measure 1/2 Tbsp of the mixture into a small baking pan and use a brush to spread around. 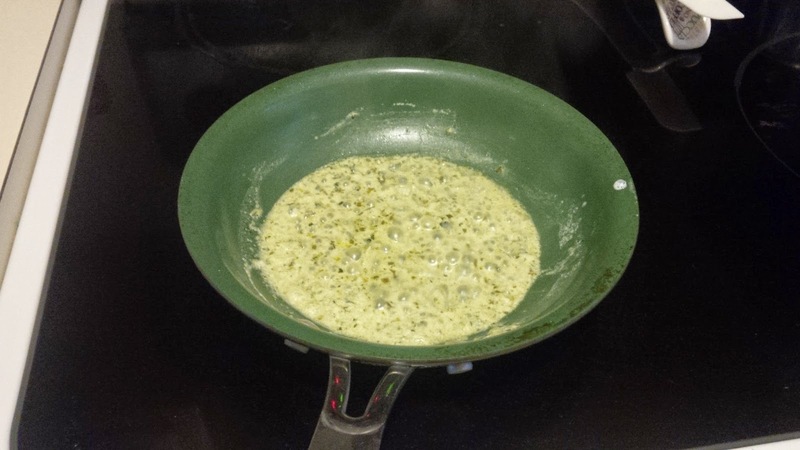 4) In a small skillet heat oil over medium-high heat. 5)Drain tofu and cut into small strips. 6) Dredge in corn starch and place in skillet. 7) Flip tofu after 3 minutes, move to one side of the pan, and add the mushrooms. 8) Cook for and additional 6 to 8 minutes or until mushrooms and are tender and tofu is cooked on all sides, turning occasionally. 10) Mix remaining spice mixture with greek yogurt. 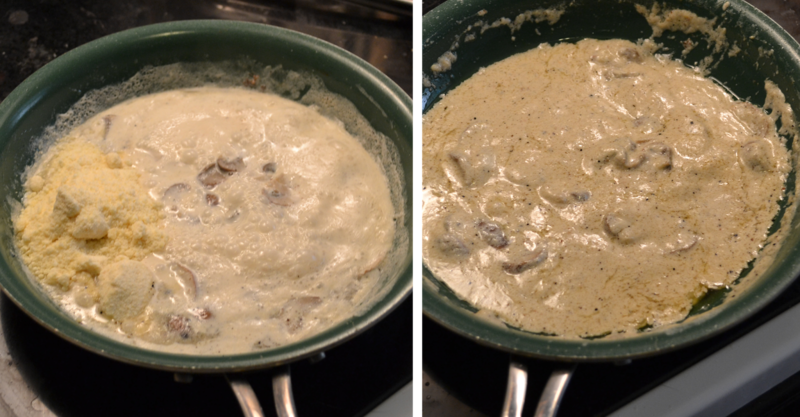 11) Mix 1/2 cup of the cheese and all but about 2 Tbsp of the yogurt sauce into the tofu and mushrooms. In this photo, I'd forgotten to add the cheese so it will be more saucy. 12) Wrap tortillas in damp paper towels and microwave on high for 30 seconds or until warm and softened. 13) Spoon mushroom filling into tortillas, fold the sides over, and place seam-side-down in prepared baking pan. 14) Brush remaining yogurt sauce sauce over the enchiladas and sprinkle with remaining cheese. 15) Bake for 18-20 minutes until the cheese is lightly browned and spice mixture is bubbling. 16) If desired, serve with salsa, hot sauce, or additional sour cream.